StartupReporter publishes a new article of the series “Startup Journey: from 0 to 1”. In this series of articles, we would like to show startuppers not only through their innovative projects but also by talking about their personality and the team. Oleksandr Komarevych (OK): – Norberto, please tell me what Bitmonds is, where did the idea of the digital diamonds come from and why in this period? Norberto Rossi: – With Bitmonds we introduce two disruption elements on the playground: luxury can be full digital and exists a hybrid model of the Blockchain, which maintains its security, but without requiring cryptocurrencies for the end user. A digital collectable is ideal for entering the mass market because collecting is part of human nature, feeling part of a tribe but at the same time trying to stand out with a precious piece. We have chosen a diamond because we want to demonstrate that a digital asset can have value as a physical asset. Why not a diamond! A buyer, for different reasons, today cannot really know if he is buying a bloody diamond or a synthetic diamond, and therefore the real value of his good. With a Bitmonds the characteristics of purity, the value and the genesis of the good are certain. And the market already seems to like this new concept. OK: – What is unique about Bitmonds? What can I do with digital diamonds? Norberto: – Each Bitmonds is unique in the world because its appearance is defined by the user’s registration data and the instant of generation. It is possible to give a unique part of yourself to a special person. The property is immediately registered on blockchain with unthinkable performances, thanks to our own solution. The purity and the number id characterize the speed of growth of value over time, this makes it interesting to trade in the Marketplace. 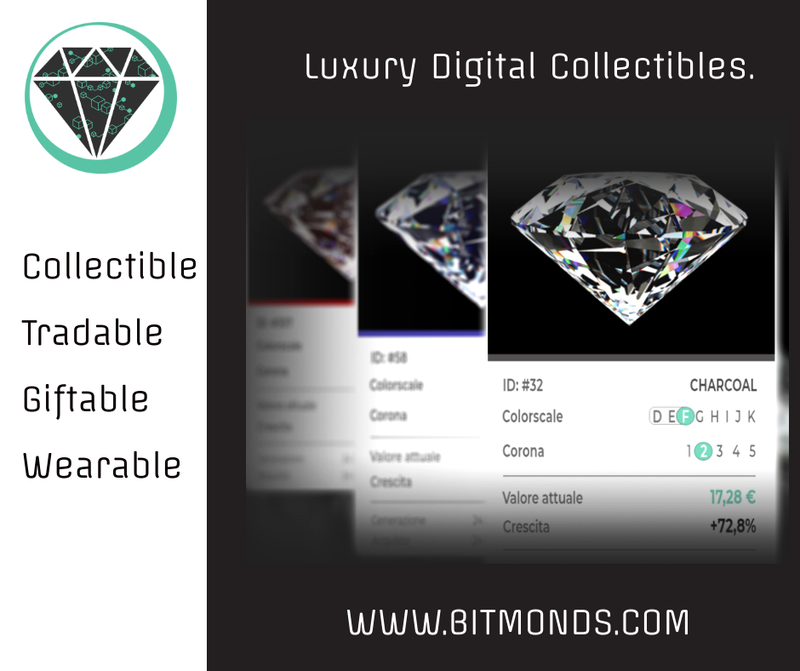 Finally, it will soon be possible to wear the Bitmonds on a smartwatch, smartphone and maybe on dedicated devices. We want them to become over time an accessory for your outfits like a tie or a scarf. As a joke, but not too much, we say that luxury watches have counted hours. OK: – The team is very important for a startup at any stage. Who is in your team? Could you tell our readers about the uniqueness of each team member? Norberto: – Our team was created by bringing together the best professionals met in a 20-year career in the Digital and Telco field. My role is to have ideas and stimulate those who are able to implement them. Gianluca is a fundamental element of balance, he makes me stand with my feet on the ground, in addition to being a very experienced CFO. Marco is our CTO, finding simple and innovative solutions among a thousand scattered pieces of glass. First colleagues, then friends and now a family. 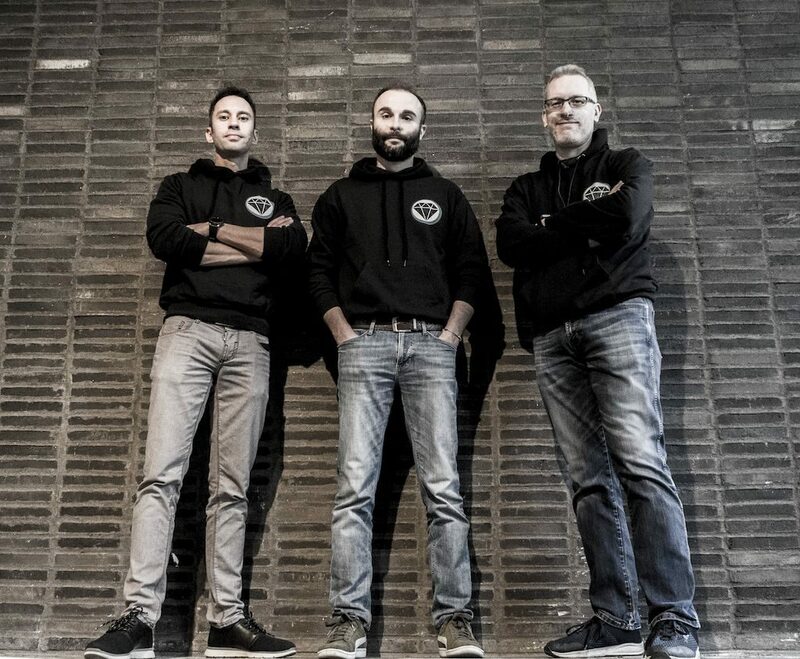 Around us there are several partners working on the project like Stefano and Enrico, our growth hackers, Luca and Giuseppe di KForge, Andrea and Luca from Critical Case, Paolo and Nicola from Synesthesia. We are able to cover all the key functions of a company with senior profiles. OK: – What is your roadmap for the next 3-6 months? Norberto: – The platform has been running for about two months and thanks to fantastic Early Adopters we have collected a lot of material to improve it. But the most important feature that will be released is the wearable smartwatch app. We did not stop at those who said that we could at most have an image or a video gif. The Bitmonds will be the ideal conjunction between the physical world and the digital world, you can touch and rotate on your smartwatch. On this, we can affirm that we have brilliantly overcome the hardware limits. By the end of the year, the Loyalty Program will be released, with which every single Bitmonds will be able to bring daily benefits such as products, services or access to exclusive services. The road is long but clear in our mind. OK: – What is your vision for the next 5 years in your field? Norberto: – Speaking of our technological soul, we believe that hybrid solutions such as ours can bring the blockchain into people’s lives in a delicate and transparent way for the end user, allowing the model to reach full maturity. And cryptocurrencies will also benefit from this because they will serve those who will work on the blockchain to offer services. Speaking of our commercial product, the market for digital collectables is only at the beginning. Last year, more than 10 digital collectables were sold for amounts exceeding $ 100,000. Forbes estimates the market at $ 370 billion in the coming years, even Bitmonds will do its part. Often, in an interview, I ask why you choose this project and not others, why where you so interested in this specific topic. Going the long way around, this brings to the questions: what kind of child were you? Did you have someone who influenced you? Norberto: – I was born after only 7 months and on December 31st, I immediately launched two signals: anticipating the times and making surprises for my family. I was an attentive observer of the world, in every detail, and then tried to modify it by daydreaming. Even today I have kept this habit. My father influenced me the most. I’ve always seen him get up every time his life has hit him. If I have the eyes of a tiger it is thanks to him. OK: – Why did you become a founder and what should anyone develop in him/herself to become a founder? Norberto: – I know someone won’t like it, but I’m not one of those who believes it is possible to develop all the features of the founder. Everyone has a place in the world and someone understands this role, he would feel out of place to do anything else. And despite the enormous difficulties of a startup, he feels he is doing the right thing. Balance and awareness are the greatest qualities for me. For example, I am a dreamer who is not at all capable of drawing, so I am condemned to physically build everything my imagination creates. Norberto: – As much as you may be the planning ninja, there will always be something you have not thought about, the unexpected scenario. And this applies to both good and evil. Balance is needed and in those moments the team is essential. Many shoulders carry weights better than two. I was lucky in this. It helps a lot to keep a diary to re-read the situations experienced, if you are reading them it means that you are still alive and therefore you managed to overcome them and if they are similar again tomorrow you will be able to manage them to the fullest. This is how you become a serial entrepreneur. Norberto: – Take the 10 people among your contacts that you think will give you an idea quality assessment. Better not friends or relatives, but your business contacts. Talk to him about it maybe using a single slide or a hand-made drawing or infographic. Receive their feedback and ask if they would actually be interested in putting money into the project. You will discover many things. For example, I discovered talking to Bitmonds to an acquaintance when it was not even a functional analysis on paper that would have been willing to invest € 50k to get a share of the future company. I realized at that moment that we would do something important. – A ticket to return to Turin at a time of particular workload. He allowed me to spend a nice evening with my childhood friends who recharged my batteries. Creating a startup is like any other job, not an apnea hurdle race. As in all work activities, the personal balance between loading and unloading the mind is important. OK: – What is the book (or books) you’ve given most as a gift, and why? Or what are one to three books that have greatly influenced your life? Norberto: – “If nobody has ever done it, there will be a reason” especially said by people who do not have an entrepreneurial experience behind them. It is important to listen to everyone, but then you always have to decide for yourself. Norberto: – Create a network of stable and lasting relationships based on fairness and transparency. If you work well with people, one day they will be the most precious resources to see your project begin. At Bitmonds there are also professionals who I met in my first experience worked in 2003 and never seen again. A certain type of approach, cementing relationships forever. Norberto: – I always sleep with an old plastic bottle over my head, to which my grandfather had attached small aluminium wings. My grandfather was a farmer and he had put hundreds in the whole field. His vision of a micro scarecrow distributed in a certain sense anticipated the concept of 5G microcells! That strange object is the first thing I see when I open my eyes, it always reminds me of where I come from and to keep my feet on the ground. OK: – Norberto, what would you like to wish the readers? Norberto: – Work on relationships and not just on the idea or the prototype. Relationships are those that allow you to create the right team, those that give you visibility at the beginning even if you have little money, those that allow you to get early adopters or even understand that you are on the wrong path. The success of a project starts many years earlier than even just having it designed as a concept.